Jan van Deventer’s side, who sit in second place, now have a six-point cushion following their excellent victory in Lancashire and Chester remain just a single point behind Hull Ionians. The league leaders had to battle back from a slow start against Otley to clinch the win which keeps them at the summit, while Huddersfield hammered South Leicester to stay in the hunt for a top two finish. Down at the bottom, Macclesfield are still fighting for their National Two North survival after beating Peterborough Lions while elsewhere across the division, there were victories for the in-form Sedgley Park and Preston Grasshoppers. There were also narrow wins for both Tynedale and Wharfedale who edged past Leicester Lions and Sheffield Tigers, respectively. Hull Ionians recovered from a nightmare start against Otley to secure a crucial victory in the battle for promotion from National Two North. The league leaders trailed 17-0 after just 15 minutes as Joe Graham, Ben Magee and Josh Hall all crossed for Otley. The I’s then clicked into gear and led at half-time following tries from Steve Slingsby (2) and Ben Bell, while Lewis Minikin kicked seven points. Ben Stephenson stretched Hull Ionians’ lead to 29-17 shortly after half-time and Otley could only add to their tally two minutes from the end as Joe Rowntree clinched two bonus-points for the hosts. Victory for Hull Ionians keeps them one point clear at the top, but they now hold a seven-point advantage between themselves and third-placed Huddersfield. Chester took a major step towards finishing in the top two in National Two North as they defeated promotion rivals Fylde at Woodlands. The hosts flew out of the traps as Ben Gregory and Tom Carleton crossed to make it 12-0 in as many minutes, but Chester responded in style. Michael Craven and Alick Croft touched down to make it 14-12 to the visitors before tries from David Ford and Andrew Oakden put Chester in control. Chris Briers did hit back for Fylde on 68 minutes, but Chester wrapped up a potentially significant victory when James Robins landed a penalty. The win for Chester has moved them six points clear of third-placed Huddersfield and with four matches to go, Jan van Deventer’s side are very much in charge of their own destiny. Huddersfield remain in the hunt for a top two finish in National Two North as they thrashed relegation threatened South Leicester at Lockwood Park. The rout leaves Gareth Lewis’ side six points behind second-placed Chester ahead of their clash this coming weekend. The hosts took a 49-7 lead into the break after a totally dominant display. Huddersfield scored 13 tries in all, with Kian Stewart dotting down on four occasions while Lewis Bradley, Lewis Workman and Chris Johnson all grabbed doubles. Thomas Hodson, Francis Entressengle and Joe Green also touched down for the home side. On a tough afternoon for South, they did manage to claim a try bonus-point as Myles Bean scored a hat-trick and Will Cave also dotted down. The result for the Midlands club leaves them 15 points from safety with four fixtures remaining. 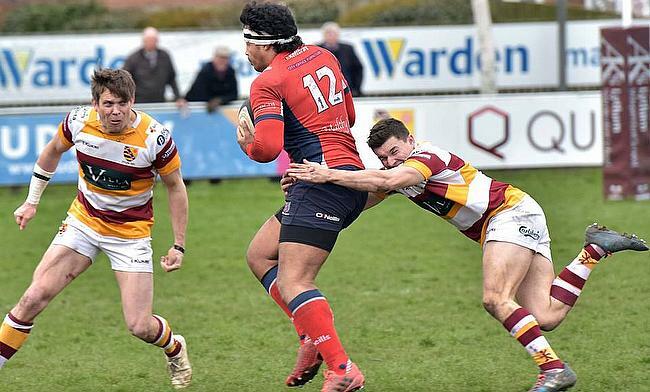 Sedgley Park maintained their excellent recent form as they made it five wins on the spin against Stourbridge. Matt Bebbington’s side dominated and their strong end to the season continued in Round 26. Callum McShane, Richard Lepori and Matt Riley claimed first-half tries with Ollie Glasse, Sam Lowthion and Andy Riley scoring after the break. Steve Collins converted all six of Sedge’s tries while Hal Riley went over for Stourbridge’s only score just after the hour. Two late tries from Morgan Passman gave Tynedale a bonus-point win over Leicester Lions in the Midlands. Despite scores from Guy Pike and Will Montgomery (2), Tyne trailed 26-17 with just under 20 minutes left in the contest. But National Two North’s leading try scorer was on hand to rescue the visitors as Passman crossed twice. At one stage, the Lions had led 21-5 thanks to a brace from Devon Constant and Dan Ali’s effort and even when Oliver Taylor dotted down to increase their lead on 63 minutes, the hosts could not hold on as Tyne completed an excellent fightback. Tyler Spence scored a hat-trick as Preston Grasshoppers cruised past Hinckley to secure their sixth consecutive victory. Spence scored twice in the first half and was joined by Matt Lampery as Hoppers led 20-7 at the break. Hoppers have now won six on the bounce and are already looking forward to next weeks trip to Hull Ionians. Today’s win rights the wrongs of the heavy defeat away to @Hinckley_Rugby earlier in the season. Joe Wilson had converted his own score for Hinckley in the first period, but the visitors fell further behind as Alex Hurst and Matt Crow darted over. Tom Wheatcroft hit back for Hinckley, but his effort was matched by Spence who clinched his third try of the afternoon before both teams exchanged scores to round off proceedings. Ryan Hough and Dan Madden touched down in the final 12 minutes, but this was another pleasing afternoon for Paul Arnold’s side. Wharfedale survived a comeback from Sheffield Tigers to clinch a narrow victory in this Yorkshire derby. Rian Hamilton crossed in the first-half for Wharfedale while Phil Woodhead and James Tyson scored their other tries. However, scores from Jamie Broadley and Robbie Davidson in the second period – to add to Henri Packard’s earlier effort – set up a tense finish, but Dale held on to return to winning ways. An excellent first-half display from Macclesfield proved decisive as the Blues secured a victory over already relegated Peterborough Lions. A hat-trick from Myles Hall, plus a score from Tom Morton, helped Macc lead 24-7 at half-time. Tom Lewis touched down for the Lions in the first period, but the home side stayed in control as Phil Lang, Will Davies and Hall went over. After being outclassed for most of the afternoon, the last 13 minutes belonged to the visitors as Kazu Henderson scored a hat-trick while Thomas Gulland also crossed for the Lions. Victory for Macclesfield keeps their faint hopes of avoiding the drop alight as Andy Appleyard’s men sit 15 points from safety with four matches to go.